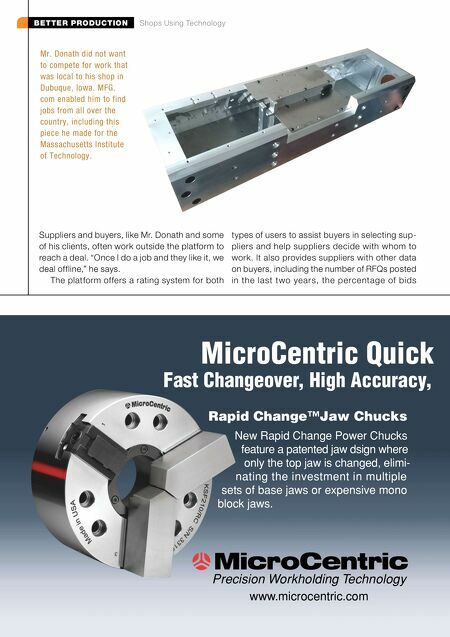 118 MMS September 2017 mmsonline.com BETTER PRODUCTION Shops Using Technology Precision Workholding Technology www.microcentric.com New Rapid Change Power Chucks feature a patented jaw dsign where only the top jaw is changed, elimi- nating the investment in multiple sets of base jaws or expensive mono block jaws. 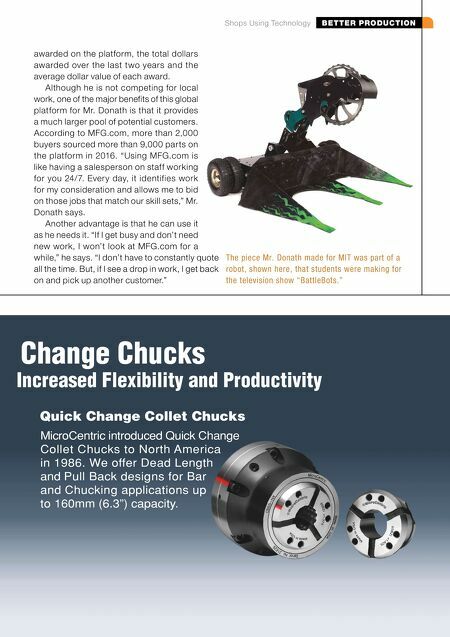 Rapid Change™Jaw Chucks Fast Changeover, High Accuracy, MicroCentric Quick Suppliers and buyers, like Mr. Donath and some of his clients, often work outside the platform to reach a deal. "Once I do a job and they like it, we deal offline," he says. The platform offers a rating system for both types of users to assist buyers in selecting sup- pliers and help suppliers decide with whom to work. It also provides suppliers with other data on buyers, including the number of RFQs posted in the last t wo years, the percentage of bids Mr. Donath did not want to compete for work that was local to his shop in Dubuque, Iowa. MFG. com enabled him to find jobs from all over the country, including this piece he made for the Massachusetts Institute of Technology.